For many working class men and often their children and sometimes their wives and girlfriends, the ‘Sunday Constitutional’ was a big part of the weekend. 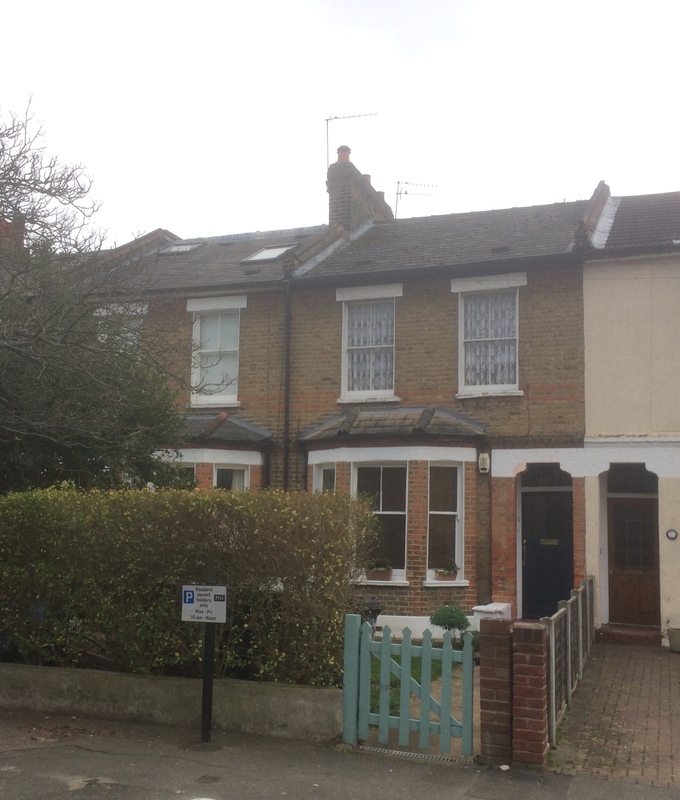 The ‘Constitutional’ that we are about to follow is that of the Noble family from 49 Lampmead Road in Lee (below) in the late 1920s and early 1930s. Their life in Lee formed part of the memoirs of their second youngest child, Phyllis, who went on to become Phyllis Willmott, who trained as a Social Worker and later became a lecturer in Social Policy, frequently contributing to journals such as ‘New Society’. Running Past will return to her life and memoirs several times over the next few months. Sunday morning started with the smells of the night before – the chamber pot (2) containing her father’s urine from the Saturday night at one of the local pubs, often the Duke of Edinburgh (below – eBay Sept 2017). The toilet was downstairs and outside (3). Phyllis and her her siblings were allowed briefly into her parents bed before going downstairs with her Mum whilst her Dad was allowed to sleep off some of Saturday night’s beer (4). Whilst her grandmother cooked breakfast, the men folk gradually gathered and planned the route for the ‘Sunday Constitutional’ – there were generally two routes to the Hare and Billet – either via Lee Green and the Old and/or New Tigers Head– left and right respectively below (6). 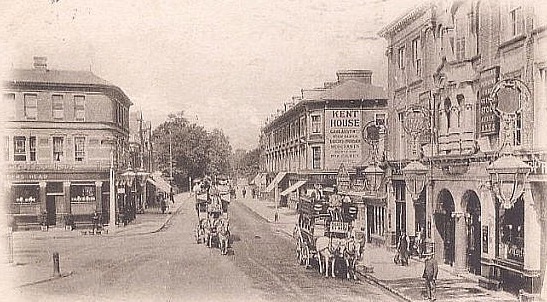 As with the route via Lee Green, other possible stopping places were not mentioned but may well have included one of the pubs in or on the edge of the now gone old housing of Lee New Town, around Lee Church Street – on these only the Swan (top left) remains, the Greyhound (top right), the Woodman (bottom right) and the Royal Oak all having closed. Whether the children noticed the early 18th century graffiti at their chest height en route is not known. 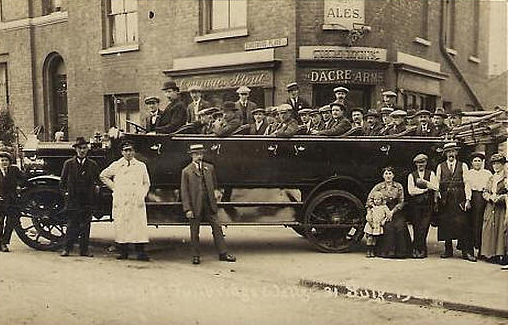 At each of the stops, the children would have ‘liberal supplies of biscuits and lemonade’ (7). While her mother and father disapproved of other parents who left their children outside in the evenings, the Sunday morning ‘walks’ were regarded as an exception (8). 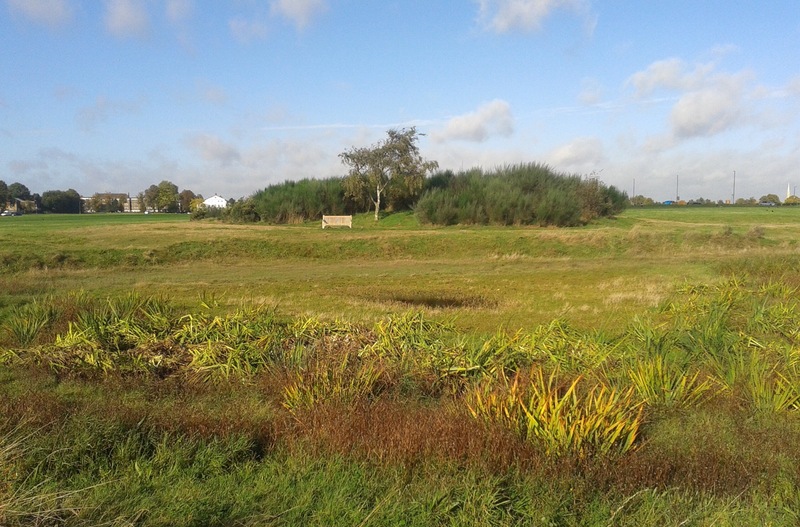 However, it seems that the children were allowed to wander off from the Hare and Billet (above) and throw sticks for the the Cocker Spaniel (who also lived at 49) – if water levels are as they are now, this may have been at at Hare and Billet pond (9), rather than the suggested pond at Whitefield’s Mount (below). The final drinking stop of the ‘Sunday Constitutional’ was described as an ex-servicemen’s club ‘beyond Whitefield’s Mount’ (22) – the most likely location was Point House Club at Point House on West Grove. The house dates from the 18th century and was once home to Grote family, responsible from Grotes Buildings, it became a hotel in Phyllis’ teens and was to become a nursing home for the Miller Hospital on Woolwich Road after World War Two. It is now flats. (11). 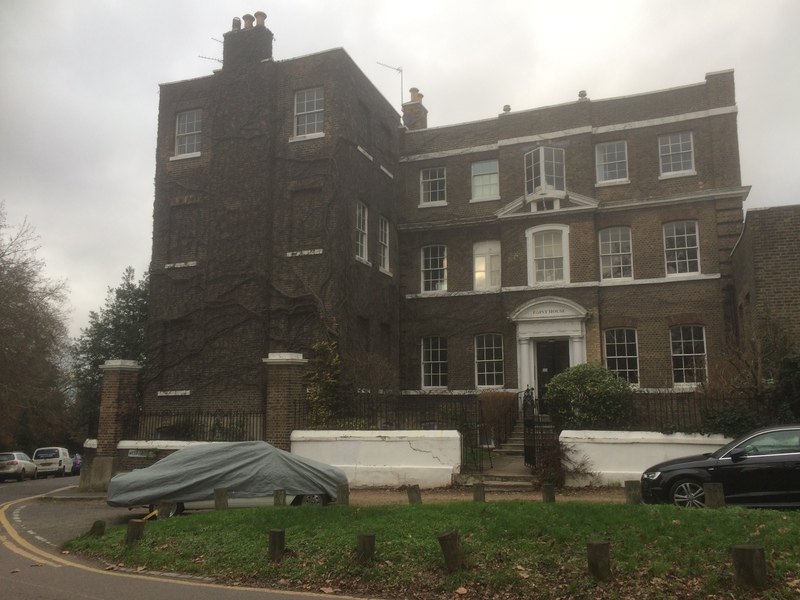 The were a couple of other options, both down the escarpment and off Lewisham Road – the probably linked Point House Club and Institute on the wonderfully named Mount Nod Square (roughly where Morden Mount School is). Also there was the nearby Bentley House Club and Institute on Orchard Hill. Unlike the pubs, the children (and presumably the dog) were allowed in the club and they remained there until closing time but often had to avail themselves of other, closed, pubs toilets on the long walk back to Lampmead Road (12). The Noble and, no doubt noble, women stayed at home to cook the Sunday roast, oddly this was done separately in the two parts of the household – Phyllis’ immediate family ate upstairs (13). After dinner, the children went to Sunday school at what was referred to as Boone’s chapel on Lee High Road at the far end of Lampmead Road (14), presumably whilst the menfolk slept off their drink and late lunch. Phyllis recalled her Dad having to be woken up with tea before the men again went to the pub when it reopened (15) – the final session of a ‘heavy’ weekend. This entry was posted in Lewisham History and tagged A Green Girl, Coming of Age in Wartime, Dacre Arms, Duke of Edinburgh, Greyhound - Lee Church Street, Growing Up in a London Village, Hare and Billet, Lampmead Road, Lee Green, New Tiger's Head, Old Tiger's Head, Phyllis Willmott, Point House, Royal Oak, Swan - Lee High Road, The Woodman, Whitefield's Mount on January 17, 2019 by Paul B. 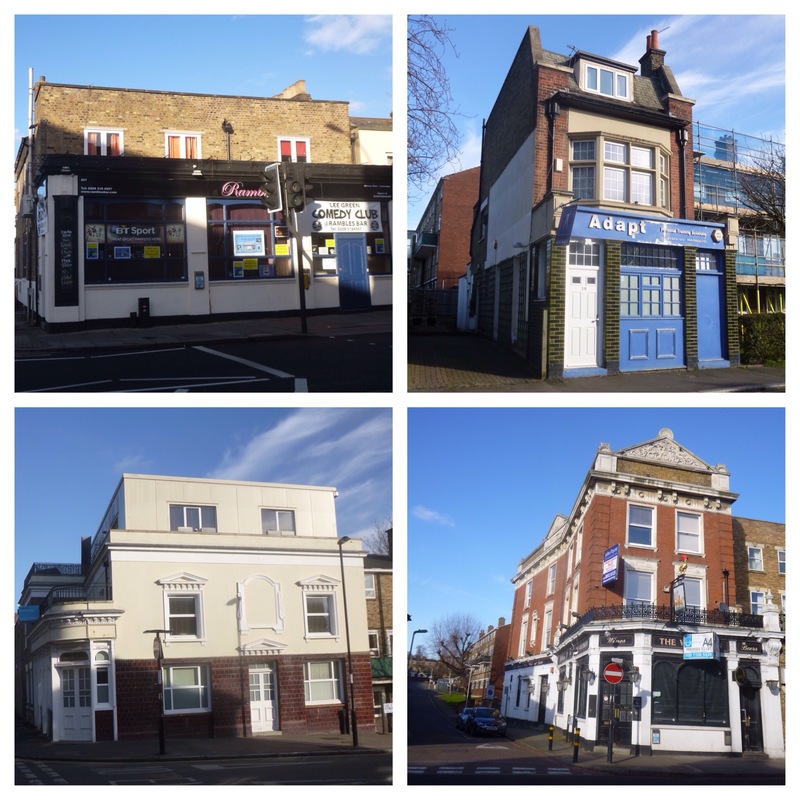 The Swan is the former name of a struggling pub on the corner of Lee High Road and Lee Church Street, now known as Rambles Bar. 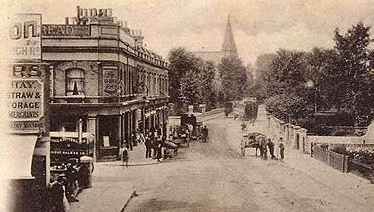 The Swan was the second pub in Lee after the Tigers Head, when the local justices approved the licence in 1838, along with the Woodman. It’s first licensee was the former parish constable, Thomas Couchman (1). Whether the building is of that age is unclear though, although it could well be. The building is almost certainly Victorian, but it is not the building that is of interest rather the former name. Its name related to a small lake at its rear, known as the Looking Glass or Mirror of Lee on which the swans of the pub’s former name once lived. The age of the ‘Looking Glass’ is uncertain although, probably goes back to the 16th century or before. There was a medieval moated farmhouse, Annesley’s house, which was roughly on the site now occupied by St Margaret’s Lee CoE school – around 100 metres behind the pub. The last days of Brian Annesley, his contested will and the subsequent link of the story to Shakespeare’s King Lear, were covered a few months ago in the blog. Annesley’s death and the subsequent break up of his estate allowed the development of some of the other large houses in Lee – notably Lee Place, which again was covered a in the blog in late 2014. 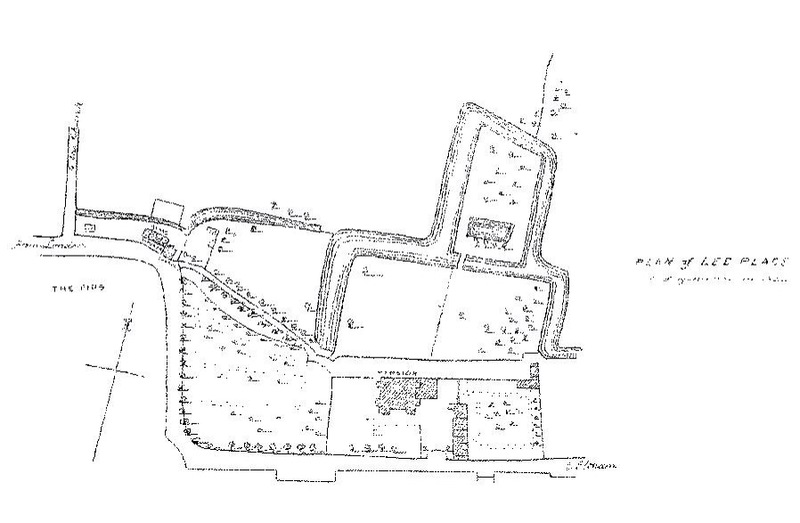 It is clear that Lee Place had an extensive partial moat – there was a plan of it in Hastead’s ‘The History and Topographical Survey of the County of Kent’ (see below) although it is possible that at least some of it may be part of Annesley’s moated farm house as Edith’s Streets suggests. Certainly, the slope of what is now Lee Church Street would probably preclude a moat much higher than the school, unless extensive earthworks were involved. massive 18th century ditch which ran east-west roughly parallel to the line of Lee High Road… it had been supported by the addition of stout timber planking nailed to raked wooden uprights. The precise function of the ditch is at present unclear. It might have once formed a moat around a manor house or could represent a relief channel for water draining from the hillside located to the north into the River Quaggy, it may have fulfilled both these functions. However, this does not rule out the Boones of Lee Place having deepened and strengthened an existing moat. A picture was ‘painted’ of the area was described in FH Hart’s The History of Lee & its Neighbourhood (1882), although as this was published over 50 years after the demolition of Lee Place, there could have been a degree of writing through rose-tinted spectacles. The whole of these beautiful views of Lady Dacre’s park and the Boone estate (Lee Place) were open to the public gaze on all sides, either by low hawhaw fences or dwarf thorn hedges. Boone’s estate was partly enclosed with a fine moat and island, well stocked with water fowl and fish. This moat was called the looking glass of Lee, and was supplied by a fine spring of beautifully clear water, rising from the high ground…… This fine piece of water ran from here southwards as far as Messrs. Bloxham and Dale’s shops, corner of Turner-Road (now Dacre Park), and from thence, westwards, to the rear of the old almshouses; a short branch ran farther south to the ancient plane tree, and under a bridge to the boat house; the overflow ran in the rear of Woodland Villas into the Quaggy river. The source of the spring seems to have been somewhere in the area of what is now Kingswood Road and was piped to cottages on the opposite side of the road to the former pub, the Royal Oak (corner of Lee Church Street and Boone Street). It is likely that this water is now culverted along St Margaret’s Passage (between Boone Street and Kingswood Road) as below a manhole cover there (and another one on Boone Street, near the top of Lee Church Street) there is always the sound of rushing water down the hill. Woodland Villas, where the overflow from the western end of the waterworks was to be found, was where the telephone exchange on the corner of Glenton Road and Lee High Road is now sited. Presumably the ‘overflow’ would have then followed Lee High Road before joining the Quaggy around Wearside Road and Eastdown Park. There is certainly evidence of fluvial activity on Lee High Road with an upward pointing 10m contour line on the 1:25,000 OS Map between Boone’s Chapel and Brandram Road – this may suggest the original course of the stream starting in the area of Kingswood Road. 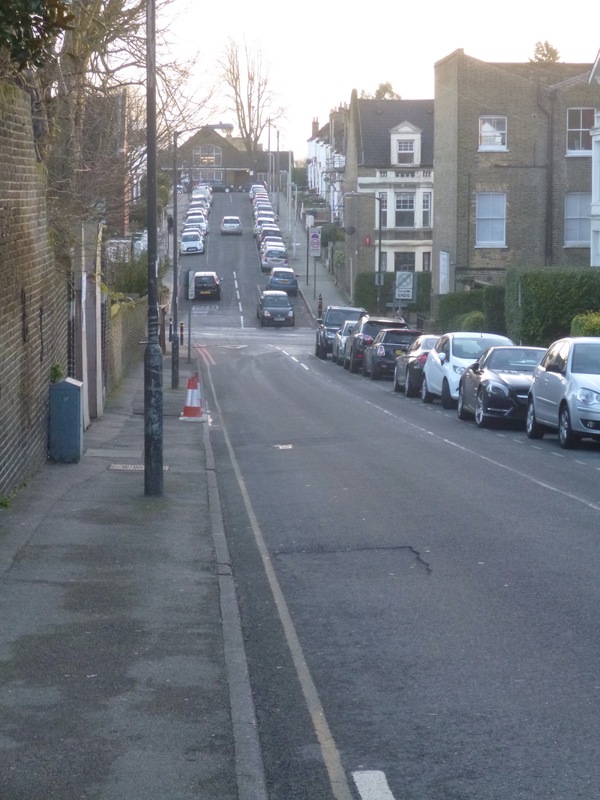 The view down Brandram Road from the entrance to the Merchant Taylor’s almshouses shows this clearly. There are a couple of alternative possibilities though which would have the stream, let’s call it Annesley’s Brook, joining another watercourse on Lee High Road, certainly the size of the valley around Brandram Road, would suggest a watercourse bigger than a small field stream. There is a little bourn, or rivulet, which takes its rise in this parish, and sometimes, on sudden rains, swells so much, as to rise near ten feet in height, where it crosses the high road, which made it so dangerous, or rather impassable, at those times for passengers, that within these few years there had been a bridge built over it, and a high causeway raised for a considerable length at each end of it, at the public expence. This brook, running from hence, passes along by the foot of the wall of the old seat of the Annesley’s, long since quite ruined; about the south side of which it seems to have made a kind of moat, and afterwards discharges its waters into the river Ravensborne in the adjoining parish of Lewisham. This seems a little confused possibly mixing up the Quaggy and Mid Kid Brook, although neither rises in Lee. One reading might suggest that it was The Quaggy that originally flowed down what is now Lee High Road with an implication that is was later diverted to its current course through Manor House Gardens. The valley through Manor Park would then have to have been created by a different stream – The Quaggy, Hither Green, which given the relative lack of erosion it caused further up stream doesn’t seem that likely. 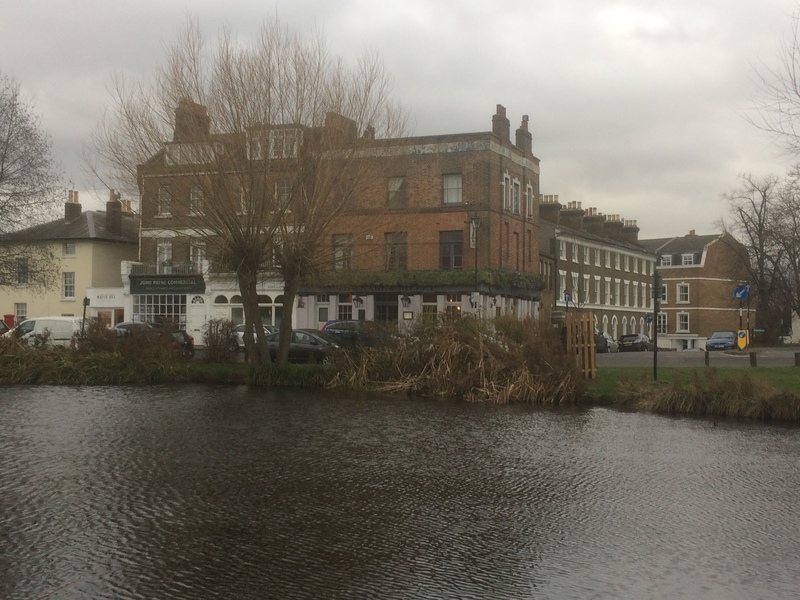 In any case, why would a bridge over the High Road near Lee Green be needed if the river was to stay to the north of the road to feed the moat? A much more likely scenario is that the watercourse was the original course of the Mid Kid Brook (there is a detailed post on the brook here) before a sink was created in Lee Road and then the Brook piped parallel to the road before emerging into the Quaggy near Lee Green. The 1:25,000 OS map contours would certainly point to this having happened. It was also the view of the sadly departed fellow river detective, Ken White, who suggested that as late as 1709, that the Brook flowed through two fields both named Conduit Field on the western side of what is now Lee Road (2). As for the pub, it seems that the former Swan is just clinging onto a business – there seem fewer drinkers than before the name change and it can only be a matter of time before it sadly meets the same fate as the three other pubs within a hundred metres or so – The Royal Oak, The Greyhound and The Woodman – and serves its last pint. This post forms part of a series of posts on the Quaggy and its tributaries, which are brought together in one page on the blog. 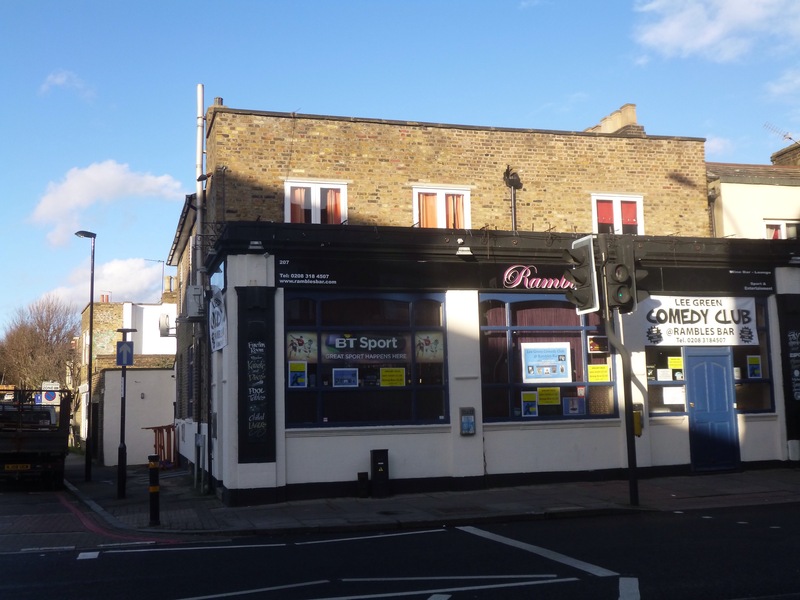 This entry was posted in Lewisham History, Rivers and tagged Looking Glass of Lee, Mid Kid Brook, Mirror of Lee, Quaggy, Swan - Lee High Road on February 11, 2015 by Paul B.